Inscription in Persian on the wall of the Tomb of Two Kamals in Tabriz. Kamal Khujandi (Persian: کمال خجندی‎‎), also Kamal Khojandi, Kamaleddin Khojandi, or Kamal-E Khojandi, was a Persian Sufi and Persian ghazal poet of the 14th century (8th century hijri). He was born in Khujand, today the capital of Sughd Province in Tajikistan. He lived in Tabriz and died in 1400 CE (807 AH). He is counted among the great romantic poets of the 14th century, like Amir Khosrow Dehlavi, Khwaju Kermani and Hafez. He was also a contemporary of Hafez. The modern Persian novelist and short story writer Sadegh Hedayat and his family trace their ancestry to Kamal Khojandi. 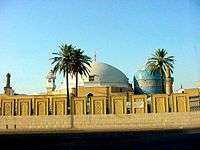 Khojandi's tomb is located in the Tomb of Two Kamals at Tabriz, Iran, beside the tomb of Kamaleddin Behzad. There is also a statue of Kamal Khojandi nearby. ↑ Katouzian, Homa. Sadeq Hedayat: The Life and Legend of an Iranian Writer. Hedayat family considered to be his descendents.